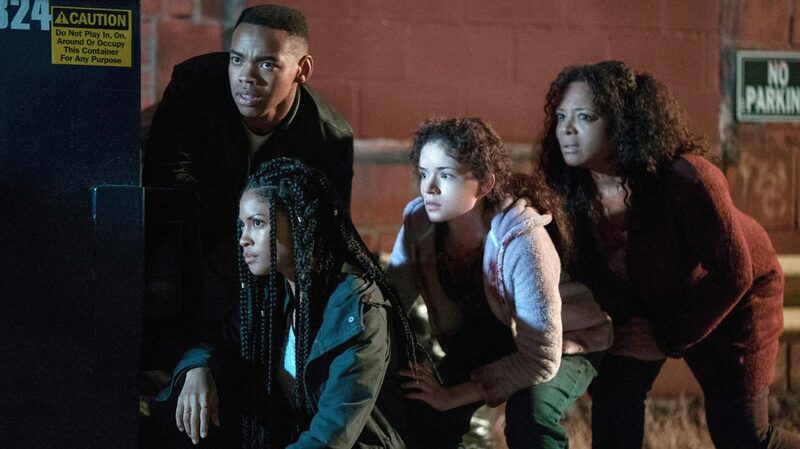 I have to give The First Purge this much credit: it patches one of the biggest holes in the Purge universe. Namely, the titular Purge itself, an annual event held across the United Stated by the neo-fascist governing party New Founding Fathers of America in which all crime is made legal for 12 consecutive hours, the idea being that people will get all of the crime out of their system and the rest of the year will be as docile and law-abiding as ducklings. For three films in a row, I hear that concept, and I think, "but that wouldn't actually work", and along comes The First Purge to concur, "no, it really wouldn't". Instead, we get a story about how the New Founding Fathers throw a lot of money out there to fake it working, and when even that doesn't work, they throw some international mercenaries out there as well. Admittedly, this more relocates the central problem from "why do they think this works?" to "why do they want it if it doesn't work?" (something about culling poor people that makes sense only as long as you refuse to think about it whatsoever), but it's nice to see that four-time series screenwriter James DeMonaco (giving up directorial reigns for the first time, to Gerard McMurray) has given some thought to the weak spots in his world-building. Because that's what the Purge movies are, really: awfully routine thrillers that try to distinguish themselves with world-building, and it's been a perpetual problem that the world they've built has been so disheveled. Because all you've got left at that point is the routine thrills. Taken on its own merits, though, The First Purge isn't devoid of interest. As with every Purge film, it wants to be a commentary on the mistreatment of the American underclass by the elites, especially in this case as that falls along racial lines. The film is set in the very near future, when social psychologist Dr. Updale (Marisa Tomei, who didn't get enough money for doing this, regardless of how much she got) has presented her research on the purgative effects of violence to the NFFA, which has just won its first election and is hitting that ugly spot where the voters are starting to notice that the party hasn't managed to make good on any of its campaign promises. Arlo Sabian (Patch Darragh), a high-ranking NFFA official, has been put in charge of testing Updale's theories in a contained environment, namely Staten Island, New York, where the residents are being offered $5000 simply to stay on the island for the twelves hours of the experiment, and even more after the fact if they willingly take part in whatever rampant lawlessness is sure to result. This has been rightly seen by Staten Island's African-American population and the world at large as a bribe for all the poor minorities to stay and kill themselves. For most of the movie, this is where we'll remain parked, with only occasional drops back to see Updale and Sabian clucking at the results of the ongoing experiment, and if there's one other thing I have to say that's nice towards The First Purge, it's that the film is deeply anxious to say something about the state of American politics post-2016, between rising white nationalism and the evolving Black Lives Matter movement. I'm not sure that it does say something, in part because it's shackled by the limitations of a scenario that divorces it from the real world, requiring among other things that a drug kingpin doesn't sanction murder because it's against the law (which goes hand-in-hand with the series' ongoing conflation between "all crime is legal" and "murder is legal"). Not to mention that the New Founding Fathers, though they are a neo-fascist party, are not our neo-fascist party. Anyway, as with all movies in this series, the inscrutable social satire is ultimately just a vessel for getting a small group of people into an urban war zone, where our basically good heroes who just want to live through the night are confronted with the wild shenanigans of the maniacs who want to watch the world burn. The heroes in this case are a generally solid lot: Nya (Lex Scott Davis) is a local activist of sorts, who used to date the druglord Dmitri (Y'lan Noel), who's not so bad himself, always keeping an eye on the safety of his community. Nya also has a brother, Isaiah (Joivan Wade), who was supposed to leave for the safety of their uncle's place in Brooklyn, but has elected to stay and take advantage of the experiment to revenge himself on Skeletor (Rotimi Paul), a local psychotic junkie who passionately believes that he must purge himself of his anger at the world, the system, and the people around him, and this is where the bad guys get the idea of calling it "the Purge" in the first place. The cast is game, but there's not too much they can do to elevate material that has been run into the ground so hard. Really, if we take out the extra dollop of social commentary in the first act and the fig leaf of being a prequel, The First Act is nothing but the same "traipse through the dark city streets as they erupt with gun battles, explosions, and hooting whackjobs with edged weapons" material of The Purge: Anarchy and The Purge: Election Year yet again, and this film is worse at it. For one thing, it badly bungles cross-cutting between its different layers of action, especially whenever it tries to go back to Updale and Sabian (at a certain point, it simply drops them altogether, rather artlessly). For another, just about the only thing this series has ever had to offer is garishness, in the sub-Mad Max 2 zaniness of the killers' garb. Presumably because this is the first Purge, there's almost none of that outside of the character of Skeletor, and the only remotely interesting visual the film has to offer is the conceit that the official Purgers are all given neon contact lenses, in either blue, purple, orange, or green, though the first two colors are reserved for narratively significant characters. McMurray uses this to good effect in the early going when Isaiah is navigating a gloomy alley - the sight of human silhouettes with bright green eyes looming up in barred windows is the first jolt of horror to hit this franchise in a long while - and later in the design of a negligible villain with his face all wrapped in cloth except for his eyes. But for the most part, this film simply isn't interesting to look at, and the action is cut together in ways that are generally sloppy and irritating, and the pacing is all wrong. It's not the worst Purge, a title that will likely be held in perpetuity by the droning first film, from long ago in 2013, but it's definitely trailing off from the last two movies, and neither one of those was good to start with. The central hook of the series remains compelling, but it's beyond clear at this point that the movies are never going to do anything interesting with it.